Rick's Cafe Texan: Oscar, Take Me Away! Well, the 11th Academy Awards had some interesting historic tidbits. It was the first time that a foreign-language film was nominated for Best Picture (the French Grand Illusion). As of today no foreign-language film has won, though a few Best Picture winners have non-English dialogue. The first Best Picture winner with non-English dialogue I believe is How Green Was My Valley (which had people sometimes speak in Welsh). It was the first time that three of the four acting winners were repeat recipients (only the Best Supporting Actress was a first-timer), and having previous winners win again would be something that would become more common in future years. It was also the second year in a row where there someone won back-to-back Oscars. Just like 1936 and 1937 were dominated by The Viennese Teardrop, Luise Rainer, both 1937 and 1938 were dominated by Spencer Tracy. Finally, it was the first time someone was nominated for both Lead and Supporting roles. Usually, when a person receives Lead and Supporting nominations the same year, they tend to win one of them. Usually, but not always. The 11th Academy Awards are also notable in that it was the last time a comedy won Best Picture for a very long time. It would be almost a quarter-century until another straight comedy would win when Tom Jones took the prize in 1963. There are musical comedies that won in the interim, and Going My Way is a dramedy, but by and large comedy itself as a genre is not highly respected by the ever-increasingly elitist Academy; those types of films are not considered "Oscar-worthy", which now has a particularly pernicious meaning. As the aunt who tries to warn the "Jezebel" to not let a good man go, Bainter gave a great dramatic, if perhaps now (at least in my memory) a somewhat mannered performance. I've seen Jezebel and think highly of both Bainter and Bette Davis in this "Not Gone With the Wind but Close to It" take of the Old South. I don't think it was a terrible choice and one that will stand both scrutiny and the test of time. 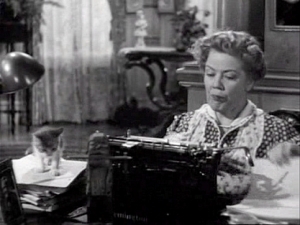 Having said all that, I still am too enchanted by Byington in her comedic turn as the sweet and daffy matriarch of one of the most eccentric families ever seen on film. She is so endearing as Mrs. Sycamore, forever attempting to create great art and being forever unencumbered by her total lack of talent or focus. Mrs. Sycamore is just a sweet dear, but she has at least one dramatic moment when the sheen of bubble-headedness disappears. As she comes close to leaving her home for the last time when her father sells it, she breaks down in tears. It's a beautiful performance. One of my favorite characters in The Adventures of Robin Hood is Una O'Connor as Bess, Maid Marion's handmaiden, who has a delightful subplot with Munch that doesn't take away from the romance and adventure and lends a sweetness and comic relief to the film. As the uppity servant who finds love and saves her 'child', O'Connor was a delightful presence from her first scene to her last. This is the second Oscar in three years for Brennan, so we have a case of 'the popular guy gets it'. This isn't to knock his performance in Kentucky, which might be very good. However, for this retrospective a criteria is whether or not people still remember either the performance or the film itself. I don't think this is the case with either Brennan or Kentucky. However, that again isn't to say that should I watch Kentucky, this won't be revisited. For me, however, there is something beautifully tragic about Morley's performance as Louis XVI in Marie Antoinette. Morley I think comes close to portraying His Majesty as he really was: well-meaning but shy and perhaps a bit slow-witted, certainly nothing like his grandfather The Sun King. However, as Louis, Morley lends the King a grace in his final days, a sad recognition that he should never have been King and would have been much better (and happier) as a simple locksmith. Morley gives him that tragic and sad air, and I think that Robert Morley gave a much better performance than Jason Schwartzmann did as Louis XVI in his cousin Sofia Coppola's version of Marie Antoinette (though the latter was not a remake). I don't think Rathbone was ever given his due as an actor. He could go from perhaps the best Sherlock Holmes (sorry, Benny...you'd come maybe 4rd, after Jeremy Brett, Rathbone, and Vasily Livanov, with both Robert Downey, Jr. and Jonny Lee Miller hot on your heels) to being the ultimate in sneering, arrogant evil as Sir Guy of Gisbourne, right-hand man to the duplicitous Prince John. It's curious that while people think the Sheriff of Nottingham was Robin Hood's primary antagonist, it is Rathbone's Sir Guy who is perhaps his deadliest. He certainly was the one most crazed and furious at Robin and his Saxon men. Sir Guy was a total imperialist, believing he and his Norman brothers should treat the native Saxons as virtual slaves. Their final confrontation is thrilling and Rathbone is so iconic as Sir Guy that I don't think that no matter what version of Robin Hood ever appears (be it the BBC television series or the Kevin Costner version or even an episode of Doctor Who), no one will equal Basil Rathbone's take on Robin Hood's main baddie. "Nobody's as good as when Bette is bad!" So the tagline for one of her films, Mr. Skeffington, read, and Jezebel shows why this was the case. 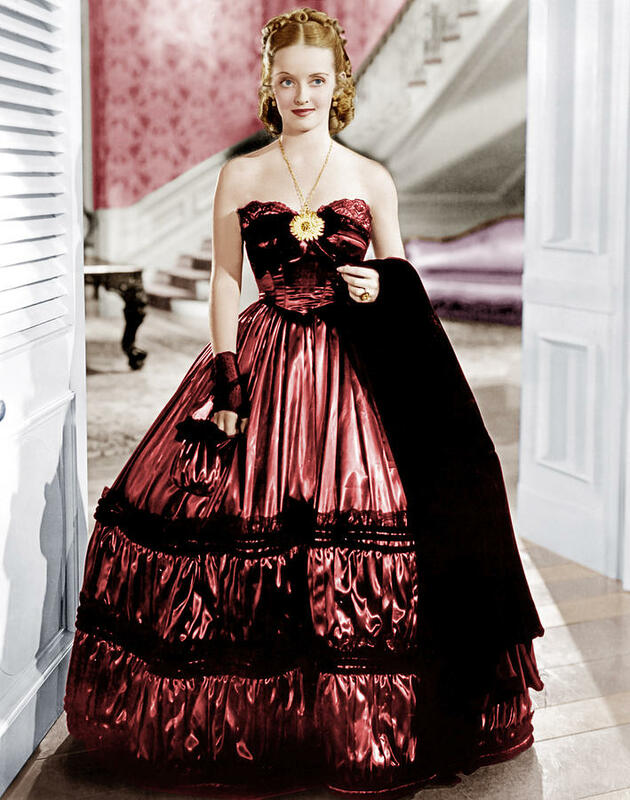 As the fiery Southern belle who scandalizes society by wearing RED to a formal ball when unmarried women only wore white (thus suggesting to all that she was not a virgin), her scene when the other ball dancers move away from her and Henry Fonda, leaving the embarrassed and angry Fonda and the horrified Davis to waltz alone on the floor says so much without saying much. Her expression from puzzlement to shock to finally unwilling acknowledgment of her mistake is a fine example of Davis' acting prowess. However, this is just the first of her many great moments when her Julie is determined to get her own way, even if it means destroying others. Jezebel is a pretty good film. However, I could never shake off the idea that Jezebel was a feature-length Gone With the Wind audition tape for Davis. She wanted the role badly (as did all actresses between 19 and 90), but David O. Selznick did not want her, and Warner Brothers wasn't too keen on the idea of lending her out either (at least I think so). I guess to compensate, they gave her this story. Sadly, this would be Davis' final Oscar, and for Shearer, her final turn at bat. Shearer was on the way out now that her husband, wunderkind producer Irving Thalberg was dead, and the Widow Thalberg no longer had protection or guarantee of plum parts. 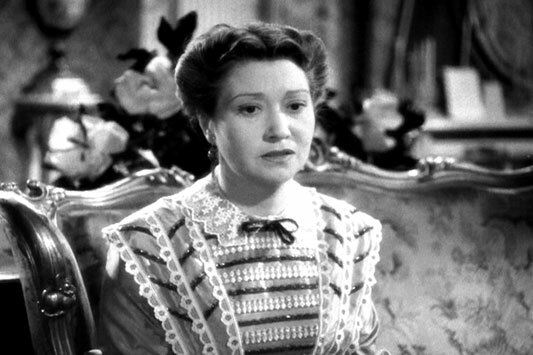 Marie Antoinette was the final project he had developed for her, and while she carried on both the lack of Thalberg and changing tastes would relegate Norma Shearer to a history lesson. Before Julie, Before Audrey, there was Wendy. Hiller was Eliza Doolitle, the Cockney flower-girl who under the arrogant Professor Henry Higgins could be made over into a proper lady. She had experience, having played the role on the stage. 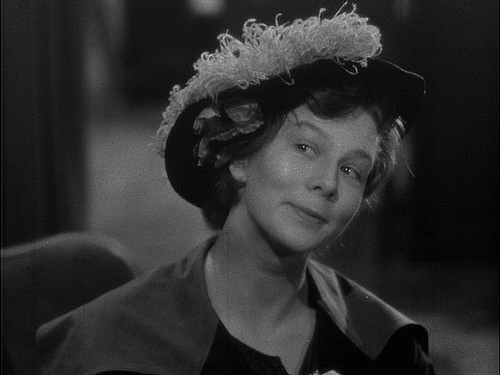 Curiously, Hiller's performance and Pygmalion itself has an odd bit of history to it. As Eliza, she uttered the line "Not bloody likely! ", making it the first time a swear word was part of an Oscar-nominated performance (though most Americans don't consider 'bloody' an actual swear word). Pygmalion did win Best Screenplay, and among its credited screenwriters was its original author, George Bernard Shaw, who I believe is the only person to win both the Oscar and the Nobel Prize in Literature. 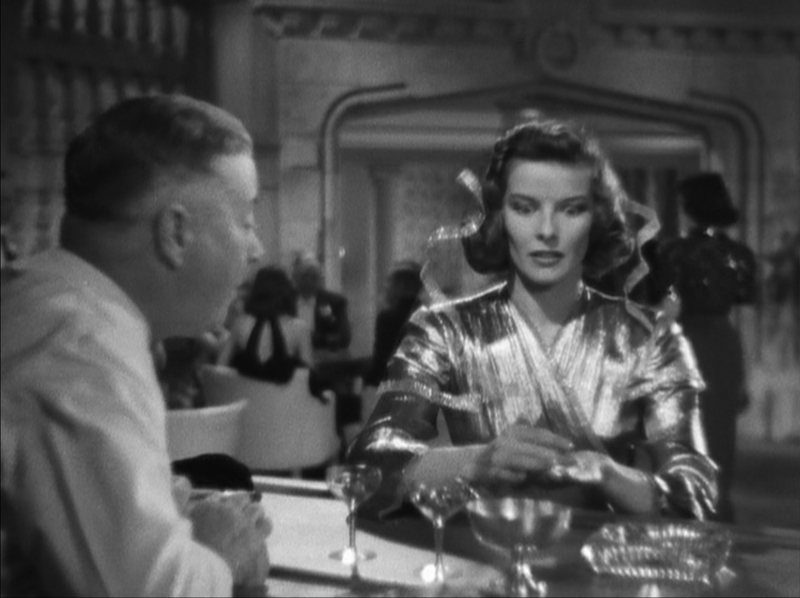 I don't think Katharine Hepburn had a real sense of humor. If I remember it correctly, when she made Bringing Up Baby she would say something that was funny, then wait to get a reaction. It took a lot of work on director Howard Hawks' part to convince her that her Susan wasn't aware that what she was saying or doing was 'funny'. Once Hepburn understood that she didn't have to force the comedy, that instead it would flow naturally from the situation, she was able to make her ditzy character into one that was hilarious. In a way, Hepburn might be spoofing her own patrician upbringing, but at least in the film it all works. 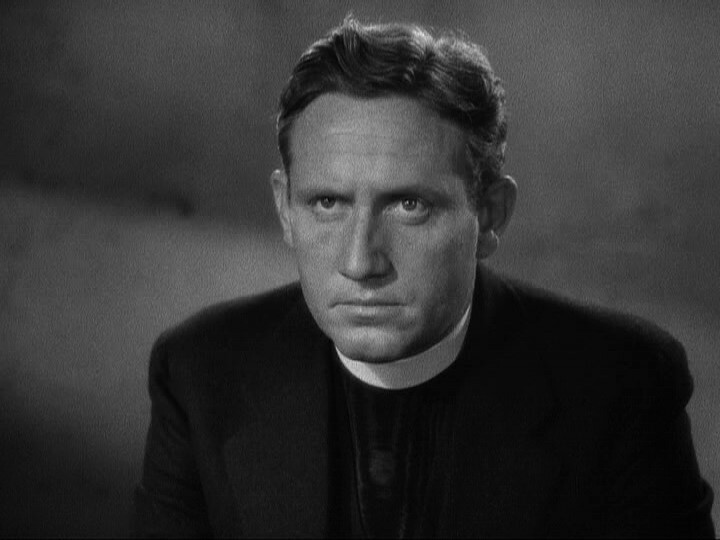 I think Spencer Tracy carried a lot of good ol'fashioned Catholic guilt around him. He was an alcoholic who constantly cheated on his good Catholic wife (most famously with his frequent co-star Katharine Hepburn) and who also felt guilt over his deaf son. This explains why he played priests in films (San Francisco and Boys Town being prime examples). Here Tracy plays Father Flanagan, the founder of Boys Town, a man who believes 'there is no such thing as a bad boy'. He obviously never worked as a substitute teacher. Of the other nominees, only Howard would miss his last chance to gain a nomination, and all the others save Boyer would win later on. However, Boyer does have something else going for him. He is the only one to have a famous line still with us. "Come with me to the Casbah" came from Algiers, and with Boyer's French accent, one could believe that line promised so much within the Arab market. Cagney was a Nuw Yawker if ever there was one, having grown up among real-life gangsters. He picked up mannerisms and speaking methods from these hoods, but Cagney was also a man of great intellect and refinement (like another film gangster, Edward G. Robinson). Angels With Dirty Faces has his Rocky Sullivan be unapologetic about being a cold-hearted murderer and is thrilled to have the Dead End Kids look up to him. When his childhood friend-turned-priest Pat O'Brien asks him to break these kids idolatry for him by not being a tough guy on his way to execution, Rocky balks. However, once at the execution as he enters the electric chair chamber, Rocky crumbles into a sniveling, frightened man. Was he really afraid, or did he in his last act do the right thing and destroy the Dead End Kids childhood fantasies about hoods like Rocky to spare them a life of crime? 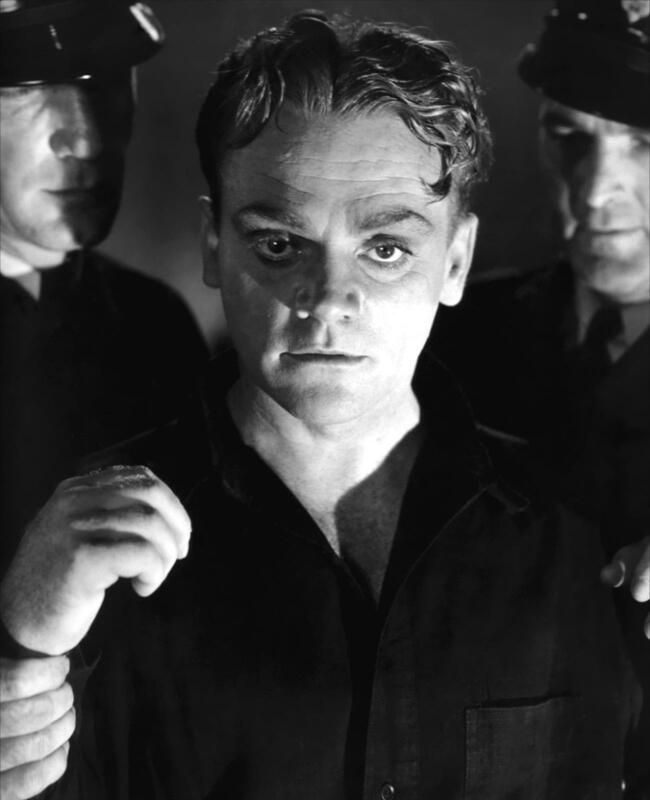 Cagney's performance leaves so much ambiguity as to what Rocky really felt, and the fact that only his voice and his shadow were involved makes it all the more powerful. It is also quite moving, even today. The original choice to play Sir Robin of Locksley was...James Cagney! Hard to imagine the tough gangster leaping about in green tights. Fortunately, Cagney's rejection of the role (correctly so) allowed another contract player to get a crack at it: The Tasmanian Devil himself, Errol Flynn. In what can only be called a career-making performance, Flynn's Robin was a man of gusto and vitality, one who enjoyed outwitting his enemies. However, much as Flynn's performance may now be open to parody and mocking, Flynn also injected both romance and seriousness into the role. Take the scene where he walks Maid Marion around the camp, introducing her to the Saxon destitute, driven from their homes and fields due to Norman cruelty. Robin doesn't hate Normans; in fact, he is loyal to Norman King Richard. However, in this scene there is no joie de vivre, but a serious man doing serious work. It's such a pity his swashbuckling persona didn't allow people to see the competent actor he was. He did help author his own destruction too, mind you, but Flynn is now iconic as Robin Hood. 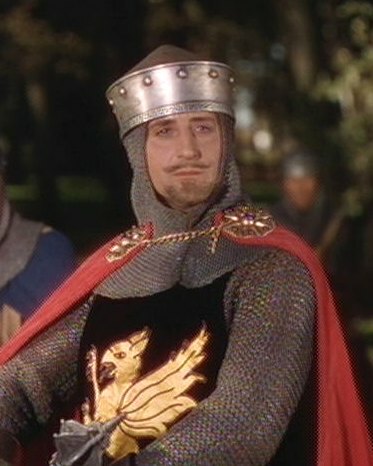 Just like Christopher Reeve will always be Superman (no matter how many others take the role) or Hugh Jackman will always be Wolverine (even if he is the wrong type physically for it), there will never be another actor who will hold a candle to Errol Flynn when it comes to Robin Hood. Frankly, I'm too lazy to list all ten Best Song nominees (and I fear there will be more nominees in the future). Of the ten nominated, the only one to have stood the test of time is Jeepers Creepers from Going Places (which I figure is a film mostly if not completely forgotten). Of the other nominees, one does stand out. It soon became known as Bob Hope's theme song, seeing as he introduced it in the film The Big Broadcast of 1938. While the reworked lyrics would fit in to whatever Hope did on a stage show or a television special, making it a light musical number, the actual song, when you hear it, is a very sad one. Hope and Shirley Ross are singing about the end of their romance, remembering the highs and lows. It's a song filled with regret about what was and what could have been, which makes it all the more strange that if people think of it at all (and don't confuse it with Fall Out Boy's similarly titled Thanks for the Memories--note the last word is plural, not singular) people think of the song as a happy one. In context, it's anything but. From The Big Broadcast of 1938, Thanks for the Memory. Music by Ralph Rainger, Lyrics by Leo Robin. It's not often a director receives two nominations the same year. In fact, the only other time I can recall this happening off the top of my head is when Steven Soderbergh received nominations for Erin Brokovich and Traffic. Unlike Soderbergh (who won for the latter), Curtiz failed to win for either of his nominations. Vote-splitting perhaps? Capra's win would be his final one, and certainly the last Best Director to win for a comedy until John Ford won for The Quiet Man fourteen years later (and that is if you consider Going My Way somewhere in between). If you count all Best Director winners from 1937 up to today, you would have seven winners for comedy (and with some films like Terms of Endearment, Forrest Gump and The Sting, I'm stretching the meaning of the word 'comedy'). If I went for undisputed comedy, the number of winners goes down to four. That's four in 75 years. Repeat, only four films that are without doubt comedies (ones with little to no drama in them) have won Best Director in 75 years, so don't tell me the Academy doesn't look down their nose at comedies. Of course, if I had it my way, a drama would have won this year too. Angels With Dirty Faces has the disadvantage of being a 'gangster' film, but it is more than that. It is a deep film about guilt and redemption with some gangsters in it. If however, I had a say in the matter, I would have no problem giving the Best Director Oscar to an actual comedy film. While I haven't seen Test Pilot, I can't shake the feeling that it is the odd one out. The rest of the list holds a pretty good number of what I would call 'classic films'. You Can't Take it With You is a delightful film about family, eccentricity, and the importance of finding real wealth with those around you. I think it's been unappreciated and while it isn't as well-remembered as other Best Picture winners it is hardly a terrible film. I cannot think of a more ICONIC film that than of the joyful, exciting, and fun The Adventures of Robin Hood. This is one of those films that really the whole family can enjoy. I would have no hesitation in watching this with my kids and parents because there is something for everyone. This isn't to downplay the intelligent themes within it: the subtle issue of racism (Normans vs. Saxons) and the injustice that stem from corruption and greed. However, The Adventures of Robin Hood is a fun and thrilling film, one that has stood the test of time. With a few exceptions (Boys Town, Grand Illusion, Jezebel, and Pygmalion) the Best Picture slate of nominees is pretty much forgotten. That isn't to say they are bad films, only that they aren't as well-remembered as at least one loser. Again, I see nothing that will equal the joy, fun, adventure, romance, and comedy of the quintessential swashbuckling epic. There is a great screwball comedy, a gritty and deep gangster film, and one of Hitch's greatest British suspense films. However, for me, nothing really equals The Adventures of Robin Hood, really one of the Greatest Films Ever Made. Next week, the 1939 Oscars. Even though I have not seen any of the Best Picture noms except for Robin Hood, I could not imagine any of them being nearly as good. It almost made my Top 100 list. I am sure there are other reasons, but I think the main reason it did not win Best Picture is the same reason why fun and entertaining Blockbusters cannot win, or even get nominated, today. 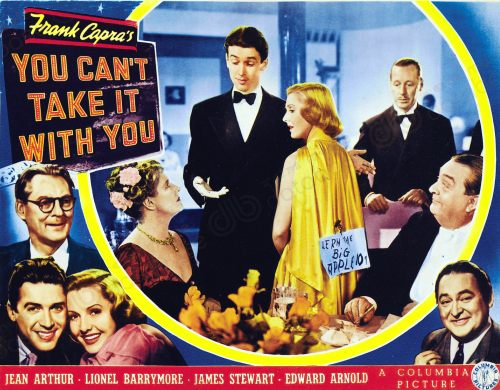 Since I always enjoy a good James Stewart flick, I should probably watch You Can't Take it With You sometime though. Stewart has a great moment when he is 'trying to stifle his impending scream'. I'd recommend it (you can read my YCTIWY review in my Best Picture retrospective). I'd recommend Pygmalion, Boys Town, Jezebel, and Grand Illusion, along w/Angels With Dirty Faces when you get a chance.